The Crystal Quest has a 4 Stage Filtration method. FIRST, water passes through a one - micron filtration pad, small enough to remove all visible particles as well as Giardia, Cryptosporidium and other microbiological CYSTS. 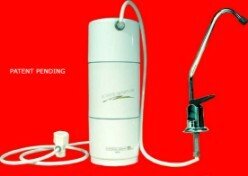 SECOND, water flows through the patented filter media which has been tested and certified by for ANS/NSF standard 61 for drinking water system component - health effect. It removes or reduces: Chlorine, Lead, Mercury, Iron (III), (II), Arsenic, Asbestos, Lindane Pesticide and Malathion Pesticide through the natural process of electrochemical oxidation / reduction. THIRD, there is more absorption and reduction of Chlorine and Bad Taste, with the Granular Activated Carbon. FOURTH, water flows through another one - micron filtration pad for further reduction of undesirable particles. The end result is total elimination or great reduction of a wide variety of contaminants. This is a ''Under Sink'' model. You may also choose the Crystal Quest ''Counter Top'' (CT) model, or the ''Refrigerator'' inline (RF) model. 3 Units to choose from (10,000 - 20,000 - 30,000 gallons).